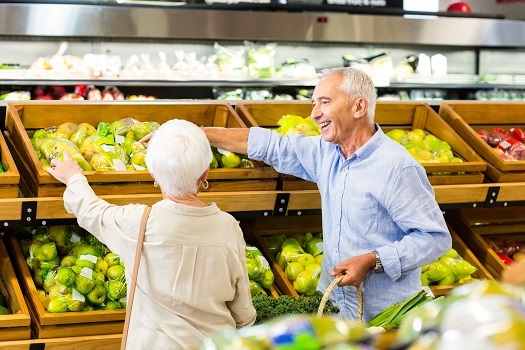 Switching to a balanced diet is essential for maintaining health, which is why it’s important for your senior loved one to make good choices at the grocery store. A healthy diet can keep diseases at bay, prevent conditions from getting worse, and provide an overall sense of wellbeing. Next time you go grocery shopping with your loved one, make sure these items are on the list. Practically all vegetables would make a great addition to your loved one’s grocery list, but leafy greens may be the most important. Studies have shown foods like kale, spinach, cabbage, bok choy, and salad greens can reduce the risk of dementia and some types of cancer because they are packed with antioxidants and important vitamins like A, B, C, E, and K.
Some seniors require assistance maintaining a healthy diet. If your aging loved one needs help managing everyday tasks or encouragement to adopt healthier lifestyle choices, turn to Home Care Assistance, a leading provider of home care. Sacramento Home Care Assi-stance provides professional in-home caregivers around the clock to help seniors live longer, happier, and healthier lives. Blueberries, blackberries, raspberries, and strawberries are all packed with antioxidants, and they are thought to be superfoods that can fight cancer. Berries can also satisfy a sweet tooth without indulging in sugary junk food, and they may even keep Alzheimer’s at bay. Studies have shown that most people do not eat enough fiber, especially seniors, which can lead to issues with the digestive system and make them prone to diabetes and heart disease. Beans and lentils are some of the healthiest fibrous foods, and they can prevent constipation and lower cholesterol. Most beans and lentils also contain some protein, something many seniors don’t get enough of. If your loved one needs help adopting a healthier lifestyle, consider hiring a professional caregiver. In Sacramento, senior home care providers can benefit aging adults in a variety of ways. From cooking nutritious meals to offering timely medication reminders, the dedicated caregivers at Home Care Assistance are available to help your elderly loved one 24 hours a day, 7 days a week. One of the best ways for your loved one to get his or her daily recommended protein intake is to eat some fish like salmon each day. Along with other cold water fish like tuna and halibut, salmon is packed with omega-3 fatty acids, which offer several benefits for seniors. Eating foods rich in omega-3 fatty acids has been shown to prevent heart disease, blindness, depression, and inflammation. Oatmeal is another food that is perfect for keeping digestive issues away because it is rich in fiber. Oatmeal consumption also lowers cholesterol and fights heart disease. Some studies have shown that this fiber-rich breakfast staple can lower blood sugar in people with diabetes and help obese people lose weight when it’s consumed regularly. Nuts and seeds like almonds, pecans, sunflower seeds, pumpkin seeds, walnuts, and macadamias make great snacks for older people. Each nut has its own benefits, and most of them contain protein. Nuts and seeds are known to battle cancer, diabetes, obesity, and joint conditions. These powerful foods can prevent inflammation that leads to heart disease and cognitive decline. From cooking nutritious meals to managing daily activities, seniors may need help with an array of tasks. Whether your elderly loved one needs part-time assistance with basic household chores or you need a break from your caregiving duties, the Sacramento respite care experts at Home Care Assistance are here to help. All of our respite care services are backed with a 100% satisfaction guarantee, there are no hidden fees in our contracts, and we never ask our clients to sign long-term contracts. Call one of our Care Managers at 916.706.0169 to create a customized in-home care plan for your loved one.